Based on a light novel/anime series, Eternal Filena is an action-adventure roleplaying game in which the player controls titular character Filena. As a Clechia, or gladiator slave, Filena is forced to fight for their life for the entertainment of others as they travels from town to town. Raised as a boy by their grandfather Zenna, adult Filena for the most part self-identifies as a man. Throughout the game, Filena is generally referred to with masculine pronouns, though Lila (Filena’s wife) occasionally references Filena’s gender identity as female. 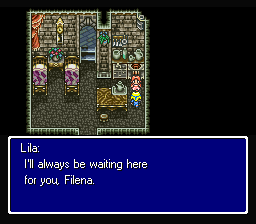 Filena doesn’t really discuss their gender identity or sexuality directly in the game text, aside from conversation with Lila. Some people have read Filena’s gender identity as being a transgender man, while others interpreted them as a butch lesbian.